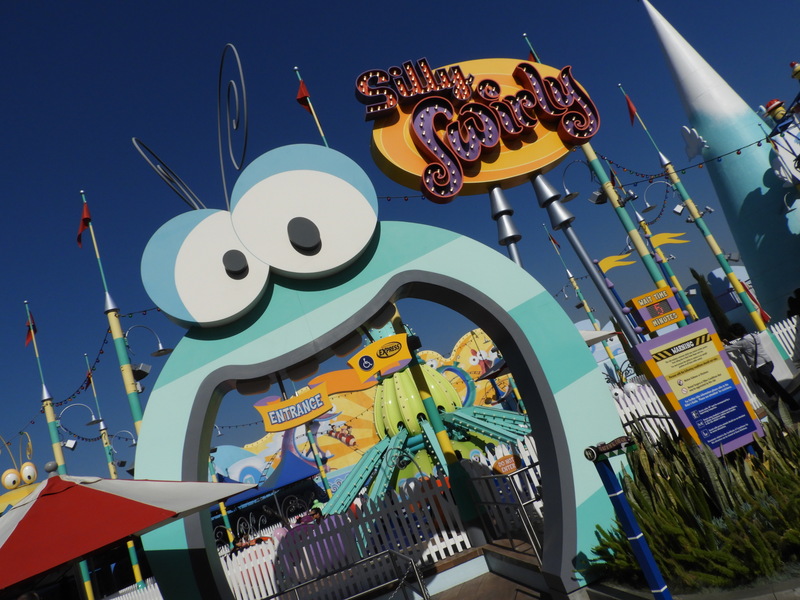 Sven: After years of looking forward to California’s theme parks, I finally took the flight to Los Angeles in February to discover some of the States’ most interesting theme parks. Yes, European Coaster Kings visited five of LA’s major parks to ride its coasters and more. Get ready for my experience at the several parks and how I compare them to our parks in Europe. 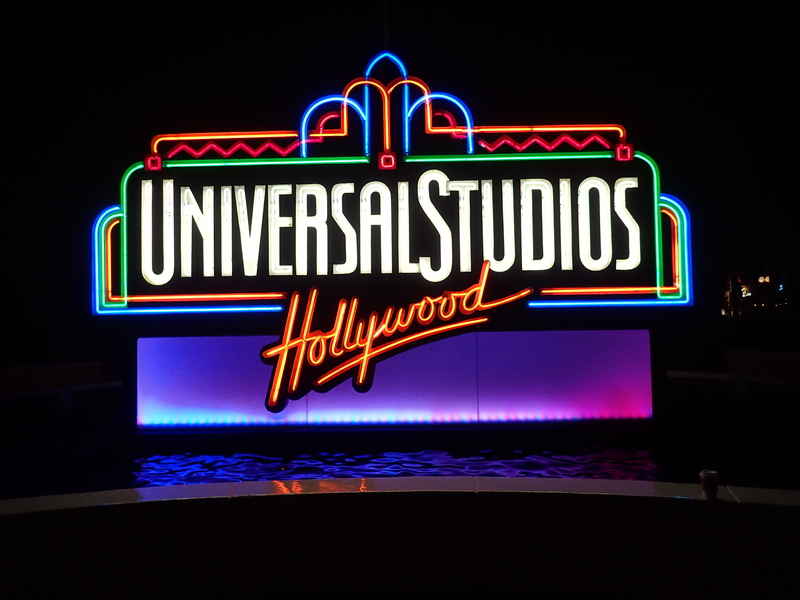 I start off with Universal Studios Hollywood. As I prepared this trip, I only looked up what kind of rides I could find at the park. This by consulting mostly the park site, while not looking at the park map though. I like to find my way once I’m at the park itself to fully experience the discovery. For Universal, I immediately noticed the few amount of rides. 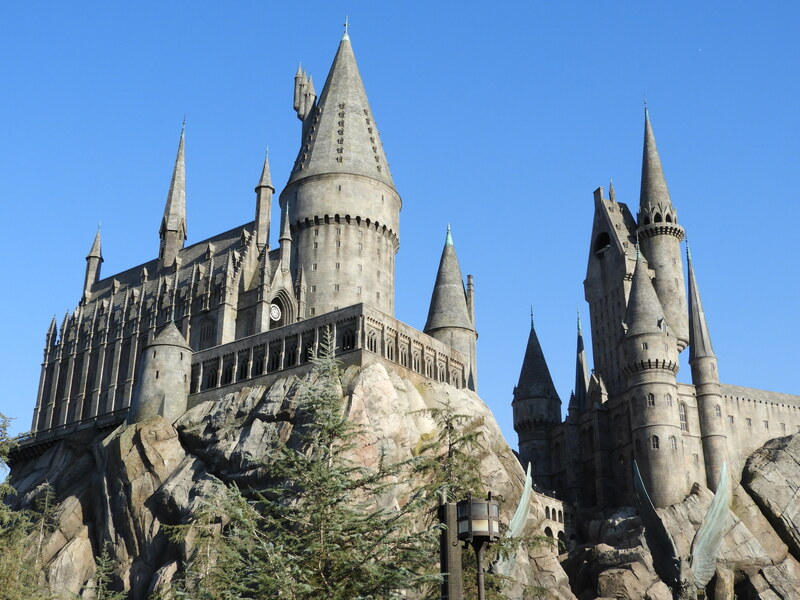 Still, as a big Harry Potter fan, the Wizarding World was reason enough to go. 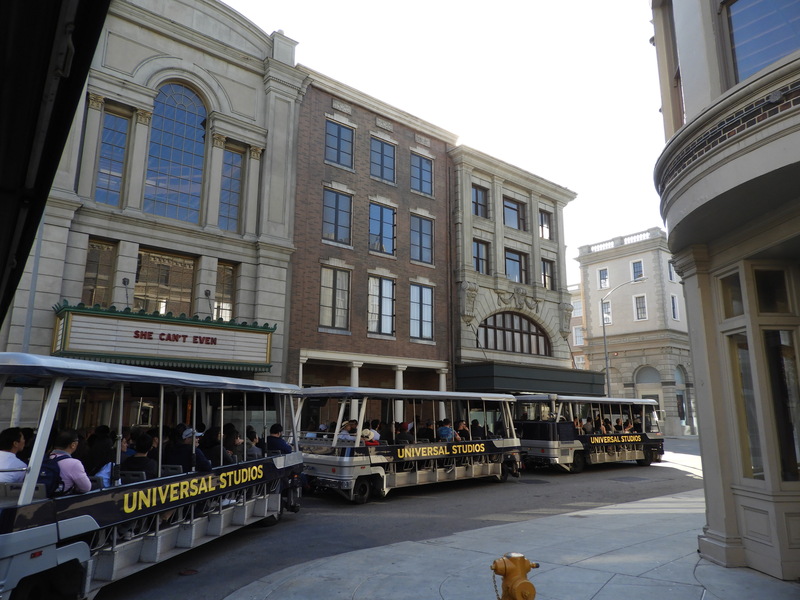 Next to that, I was looking forward to the Studio Tour as I read and heard a lot about it from Sean. 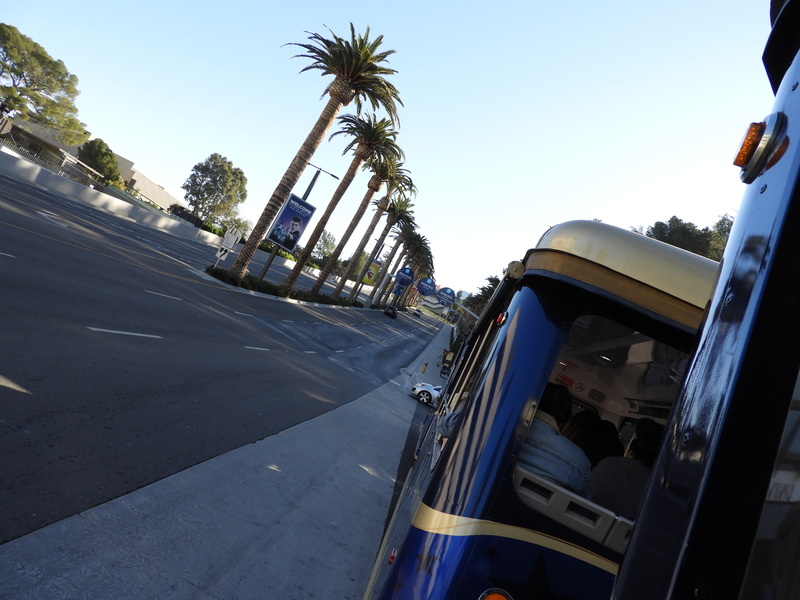 Our hotel was located in Hollywood, so we could easily take the subway to get close to the park. Once there, I was surprised about how high up the park is located. We thus waited for the little train as there would be enough walking during the day. By buying the tickets online, I was very excited for the early access to the Harry Potter area. After walking to the gates, my first impression was immediately positive. Not only because of the sunny weather (compared to our grey winter) but also the atmosphere pleased me very much. The down side of going in the low season was of course the ongoing construction. A distortion I happily accepted in return for a crowdless park. 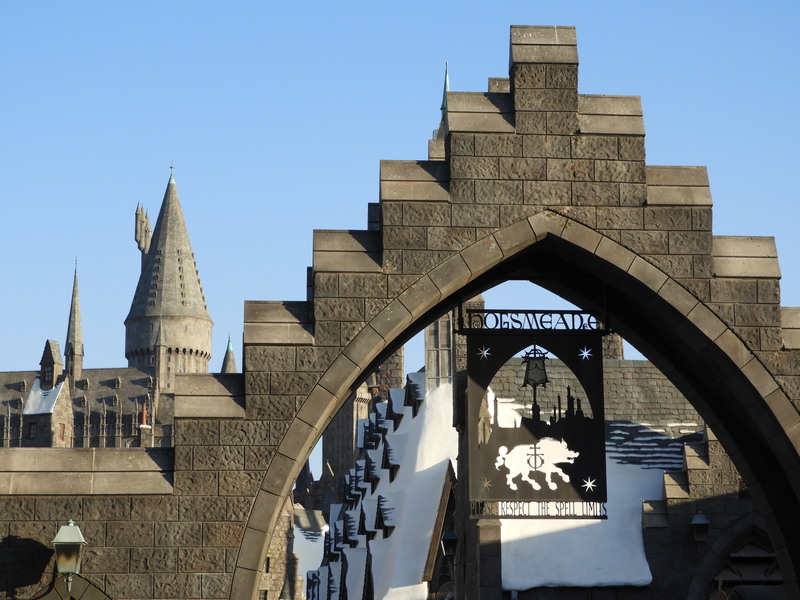 At the gates of Hogsmeade, goosebumps struck me. It was the kind of iconic moment I had hoped for. 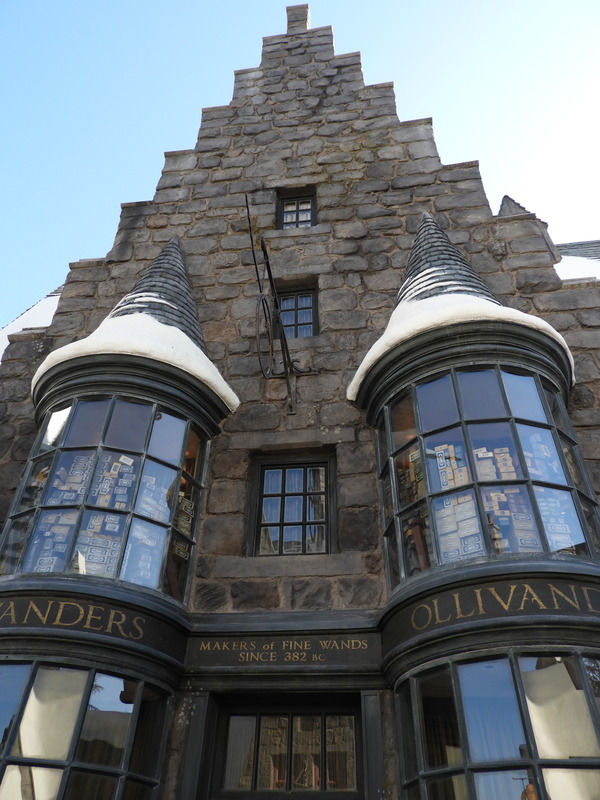 Having visited the Harry Potter Studio Tour in London, it was not my first encounter with the Wizarding World. Yet here, it felt quite immersive. I enjoyed the experience of the different real shops and the castle in the background a lot! We went straight to Ollivander’s to possibly get selected for the wand ceremony. Unfortunately, neither of us got picked (but it saved a lot of money of course). This type of experience is on the one hand quite magical by the performed show. On the other hand, it’s one of the smartest sales moves I’ve ever seen. Who can resist not buying that wand after being chosen by it? And even the HP fans that aren’t chosen, can’t really handle all those wands in the shop afterwards. I stayed strong and after browsing/resisting, we went to the main attraction. 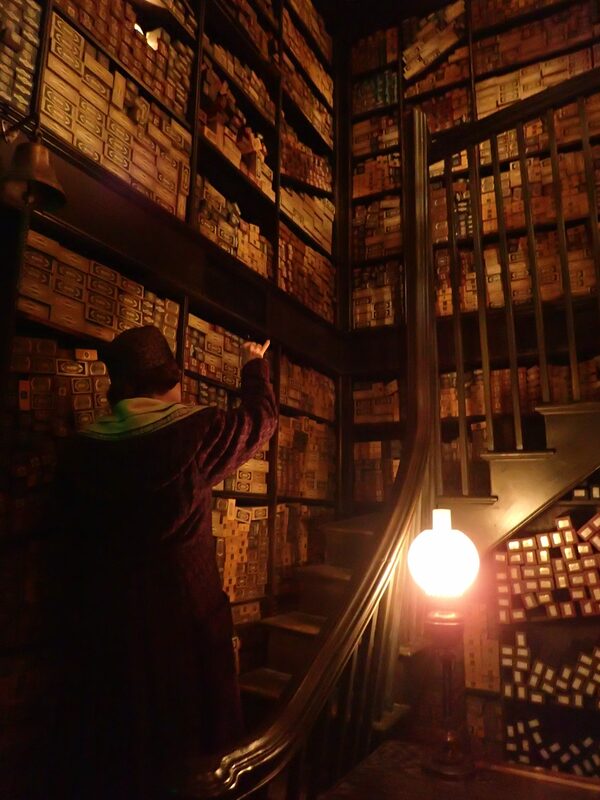 Stepping into Hogwarts was wonderful, but the magic got a bit broken by the locker room. I guess we need to accept this necessity and it pleased me to learn that they were free. Continuing on, the magic came back by seeing many iconic props from the movies. My favorite part in the queue is probably Dumbledore’s Office. 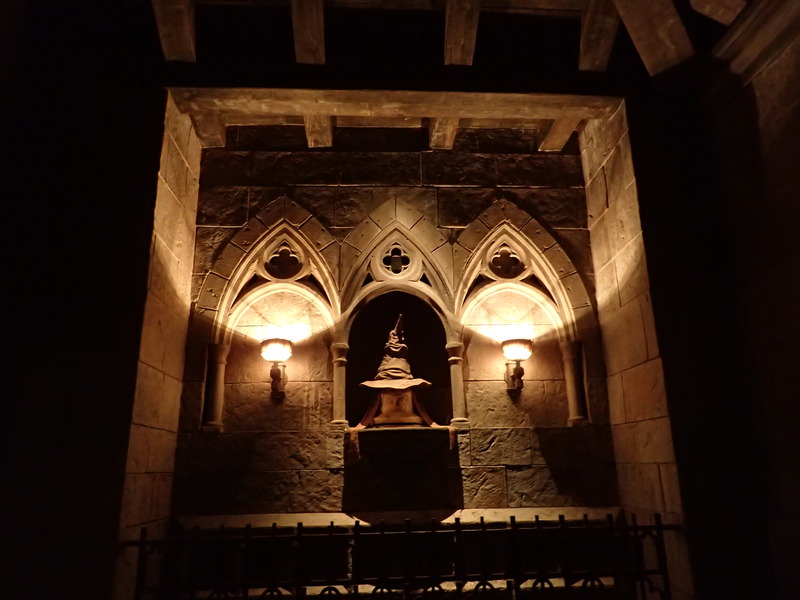 I have to say that I never really experienced the queue as we could always walk through right up to the Sorting Hat at the end (but I don’t really complain of course). I’m sure I’ll have a longer time waiting in Orlando. The ride itself was quite the experience. The system is ingenious and some of the transitions are wonderful. It made me happy to see the amount of real animatronics too as those made the ride rank much higher for me. The first time riding, I sat on the outside, which made me see a lot of the mechanics instead of having the more smooth transitions. Something I had a lot less issues with the second time riding as I sat in one of the middle seats. The downside of the ride for me were the screens (welcome to Universal I guess?). It breaks the illusion of being in the Wizarding World. All in all, a wonderful ride with an awesome ride system but not the perfection I heard of. So not the best thing I’ve ever done, but definitely my favorite “Next Gen” dark ride (compared to a Classic dark ride). Next up was the first coaster! (I can’t say of the trip, cause in Santa Monica, I already rode West Coaster the day before. Quite loved it by the way! Simple but sweet and stunning view. Now back on topic!). Flight of the Hippogriff was a new Mack Family coaster addition to my counter. Of all those I’ve ridden, it was my least favorite. Pegasus YoungStar Coaster at Europa-Park is also short, put packs at least a bit of punch. Still, I enjoyed the views of the castle by riding it. Another plus is the Buckbeak animatronic and bow moment as an introduction to the ride. The park was getting ready to fully open and so we continued to Springfield. I grew up with The Simpsons like most 90s kids so how can I not love the area? 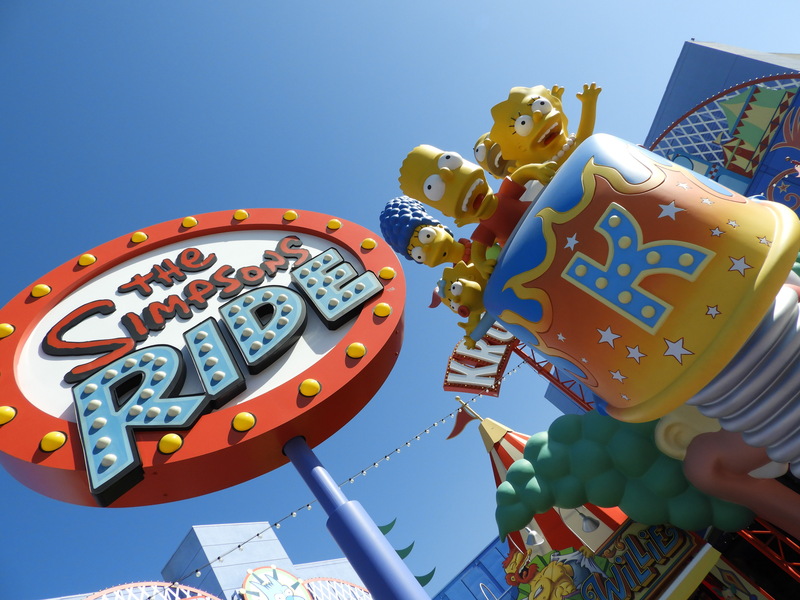 The facade of The Simpsons Ride also looks so inviting. Thus, it was time to ride! What can I say about this thing? Well, I loved the little preshow and then I was surprised about the ride system. I had an immediate flashback to Abentuer Atlantis, which is now gone as it made room for the future F.L.Y. 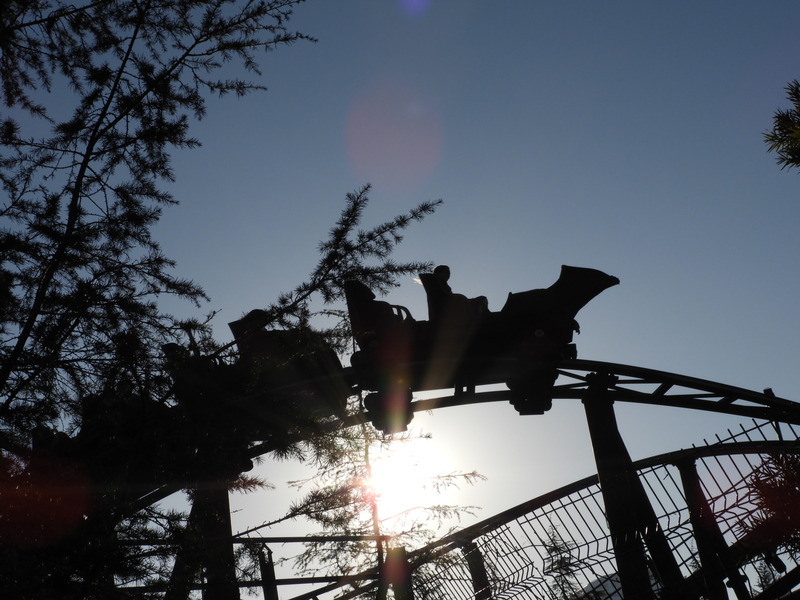 coaster at Phantasialand. Was it better? Yes, even though I loved the bad retro style of Atlantis. Did I enjoy the ride? Not sure. I got shaken so much that if I wasn’t awake yet, I was then. Glad to have ridden it, but did not need a second ride later that day. 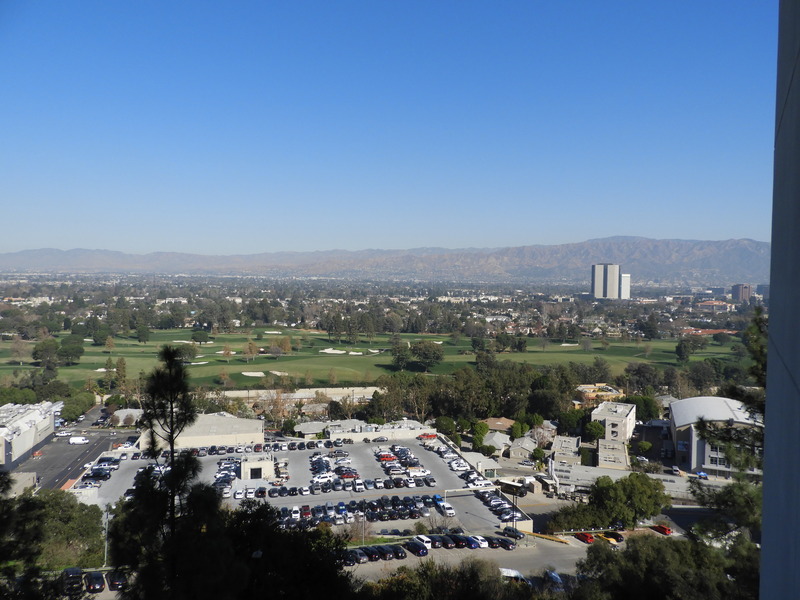 As I stepped out of the The Simpsons building, I saw the stunning view of the valley for the first time. Absolutely loved it, as it gives a more unique character to the park! However, I didn’t want to stay there too long to enjoy the view as we had more rides to do! 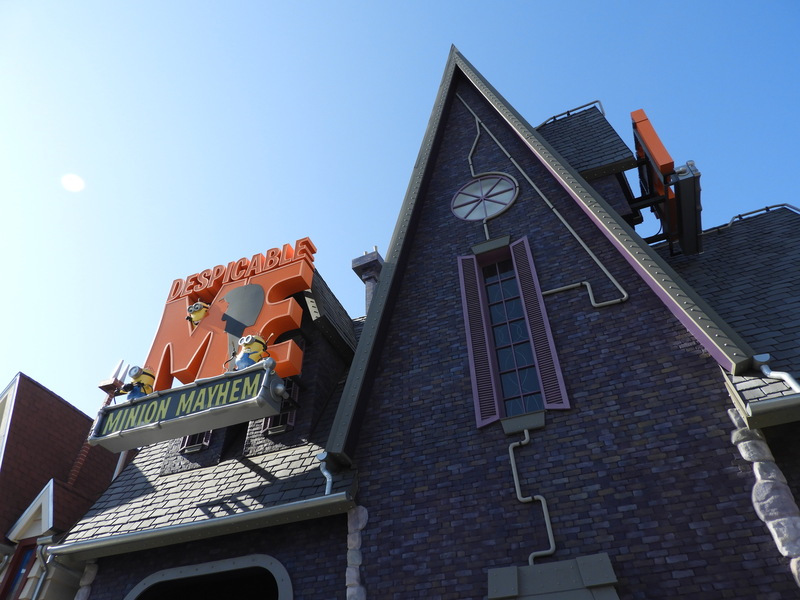 The Lower Lot was not open yet (I only learned it had an upper and lower lot that day), so we went to Despicable Me: Minion Mayhem. I do have some love for the minions but not in a “I am crazy about them” way. It was probably the longest queue of the day so either they are very popular or it has loading issues. I later learned it was a mix of both. Riding this, made me think of the Racing Legends simulator ride of Ferrari Land. Did I like the ride? Well not that much. I feel that Universal has the following strategy for most of its rides: as long as we put a screen and shake the guests a lot, we have a new ride. It is my biggest point of critique for the park. Exiting from the ride, I was surprised to see probably the only midway ride at the park in Super Silly Fun Land. Yet, I wasn’t really bothered by it cause it’s indeed a fun and well-needed area for the younger kids. 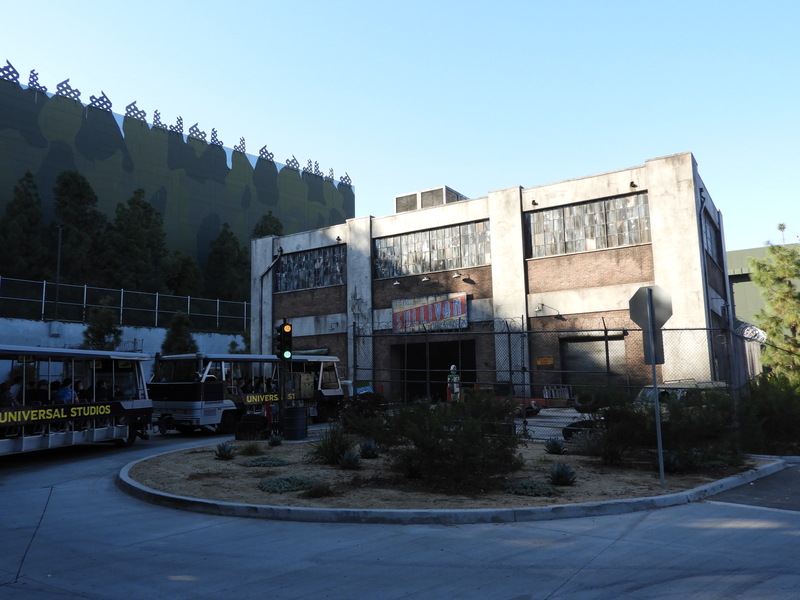 Alright, it was finally time to go down to discover the Lower Lot. Here again, I felt a bit more love for the park. Those escalators are so bizarre and yet so cool. 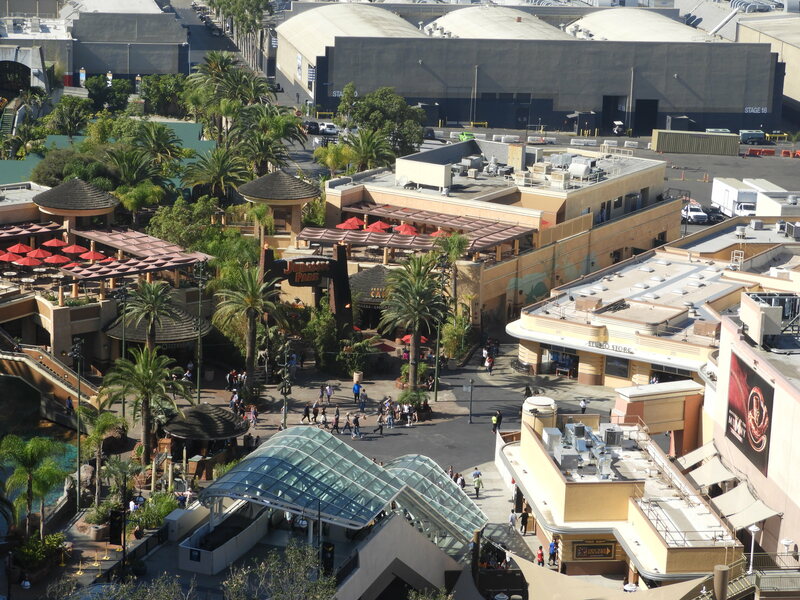 I love it how theme parks integrate themselves into an existing landscape rather than making it completely flat. So a big plus here again due to the structure of the park and the awesome view. The other surprise below was the few amount of rides. All three made me exited nevertheless. After having our picture with the Raptor (as the staff was almost screaming for people to go on the picture with it), we went to Transformers The Ride. The concept of shakin’ and screens was clearly present again. However here, I didn’t really mind cause it felt like a positive “Next Gen” dark ride. I’m familiar with the franchise but stopped watching the new movies that came out already since the second one. 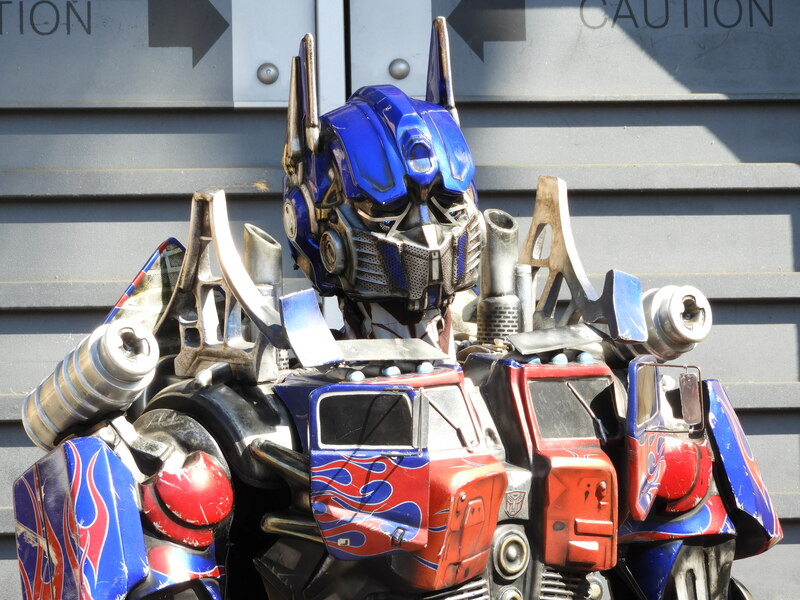 But I feel that even when you don’t know the characters, it’s an enjoyable experience with a robot theme. We continued by grabbing a bite at Starbucks and did the other two rides. 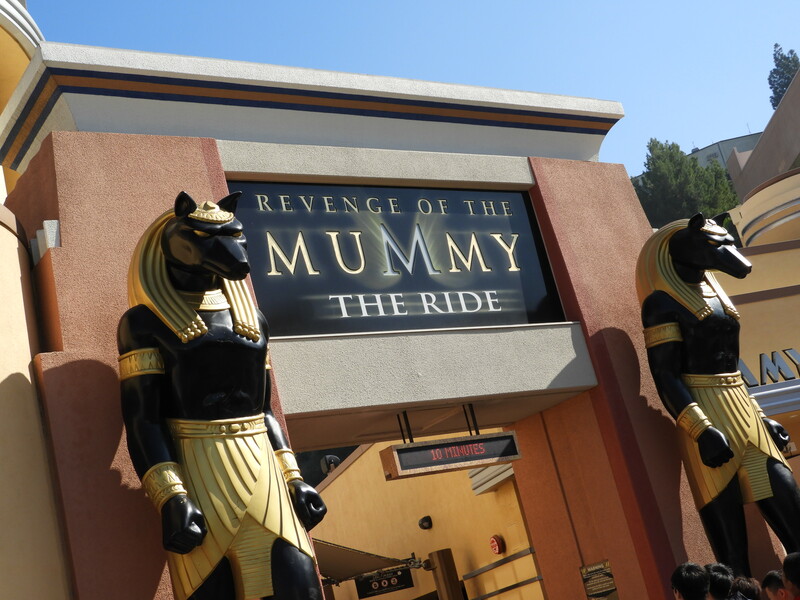 Revenge of the Mummy was coaster number 2 and I was a bit disappointed. I heard a lot of positive feedback about the one in Orlando and I thought this was the same here. Unfortunately, I was wrong and even though it wasn’t all that bad, the ride isn’t one of my favorites. 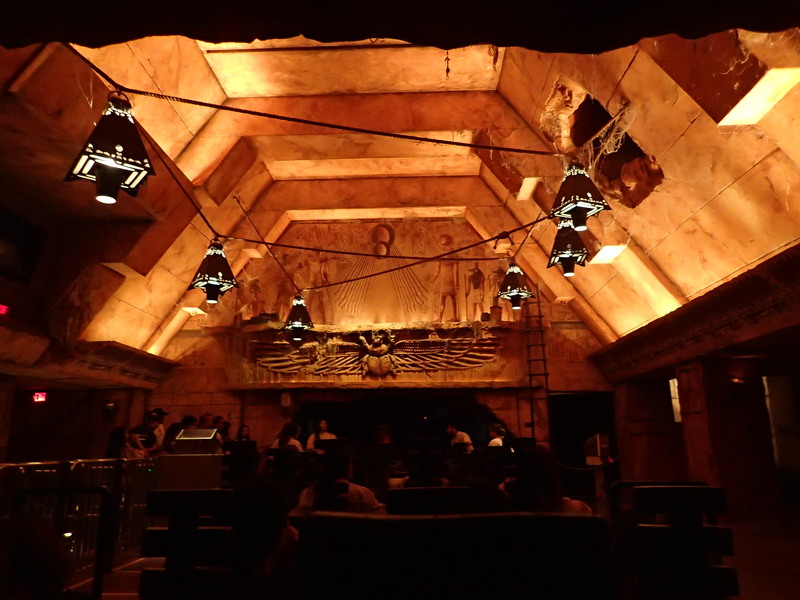 I liked the first part of the ride, especially the area where you pass by the mummy hands stretching out for the train. The rest is a pretty ok ride, but nothing more. No love for those flashy drawn mummy things in the dark or whatever they are. The third ride is now my favorite spillwater: Jurassic Park The Ride. I was surprised by how big this ride is, mostly the drop area building of course. Animatronics, some nice effects and a giant T-rex with a bang drop, what’s not to like? It’s my first Jurassic Park ride, so I can’t compare to the others. Still, none of the European spillwaters could wow me like this one. 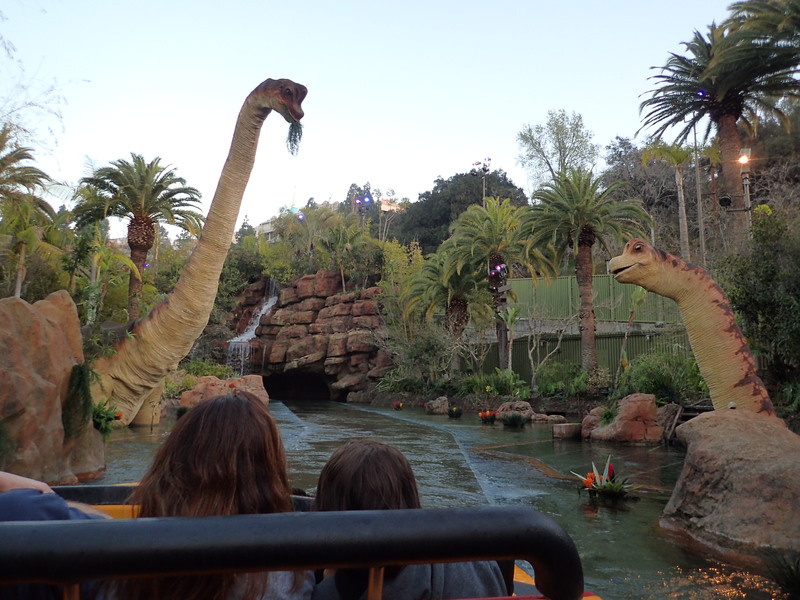 I quite like the Parc Astérix one, but it can’t compete with these dinosaurs. Hopefully they will fix the car effect before the indoor lifthill someday, cause it would have been pretty cool to see. But as we know now, Jurrasic World is coming so I hope they’ll improve it even more. Definitely the best ride at the lower lot. Next up were two of the park shows. 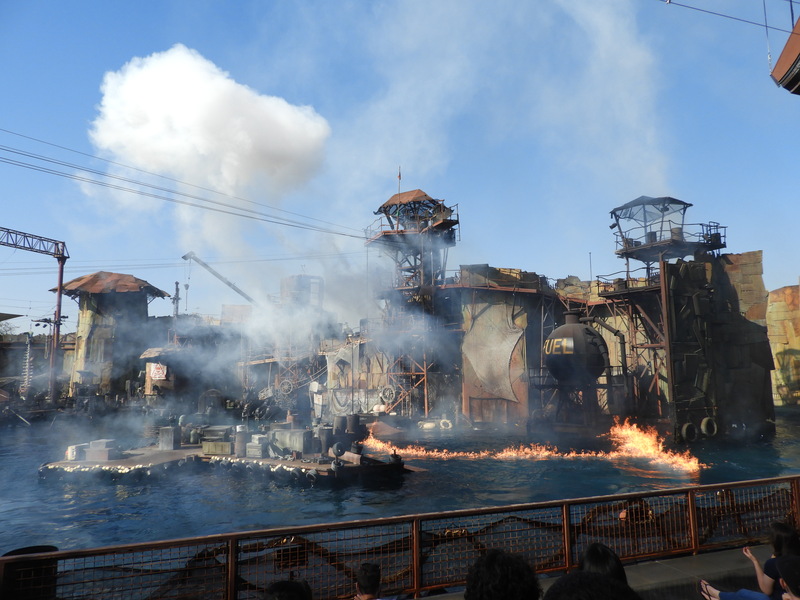 The first one we saw was the Stuntshow themed one. I am usually not much of a show man, but I guess it’s pretty obligatory at this Universal park. I was pleasantly surprised by the professionalism and the content. Much more fun than the Moteurs! Stunt! Action! Show at Disneyland Paris for example. A lot more simple, but effective. 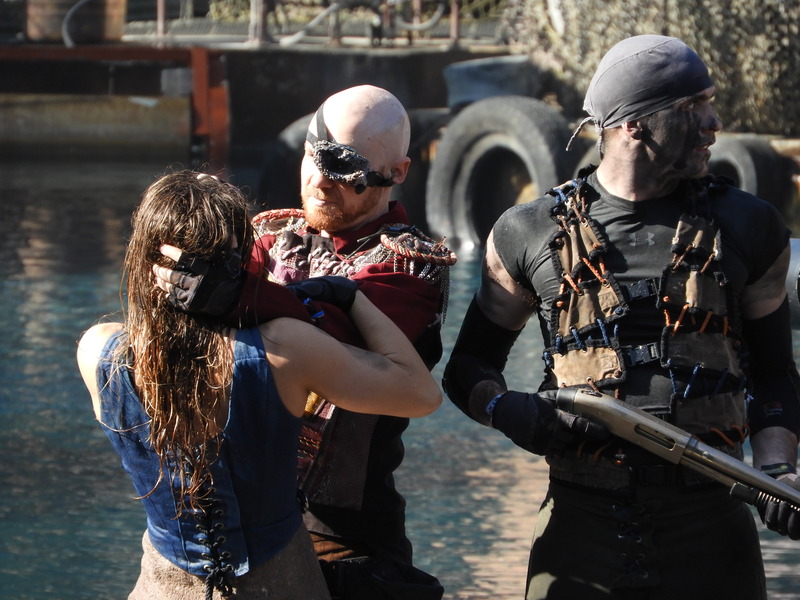 My favorite show though is definitely Water World. I like everything about this performance: the story, the setting, the characters, the effects, the humor (especially the demonstration of the splash zones) and of course the plane. Probably my favorite park show ever, with the “Main basse sur la Joconde” show at Parc Astérix coming in as a close second. Only one major ride was left to do: the Studio Tour. After quite the wait, due to filming, we got our Jimmy Fallon introduction and went alongside the real studios. I immediately sensed that this was another awesome highlight and that they need to tear down that Studio Tram Tour at the Walt Disney Studios in Paris as soon as possible. I really liked how you go through real sets (which is of course the point) and the stories joined with them. As for King Kong and Fast & The Furious, the latter one is my favorite. I compare those experiences with the Immersive Tunnel rides at Movie Park Germany and Bobbejaanland in Belgium. Well, it’s better than both. Especially the speeding effect during the FATF scene. The quality of the screens is much better. So job well done for Universal, but it makes me ignore the rides at the Parques Reunidos parks even more. My conclusion is thus rather positive. Universal Studios Hollywood was a surprisingly good park that offers few rides, but each of them is a rather big attraction. Next to that, I was able to fill up my day easily, even during this low season day. The complaint I heard about Universal parks and its amount of screens is very valid. I’m especially sensitive for it as I’m personally not a big screen ride fan at all. 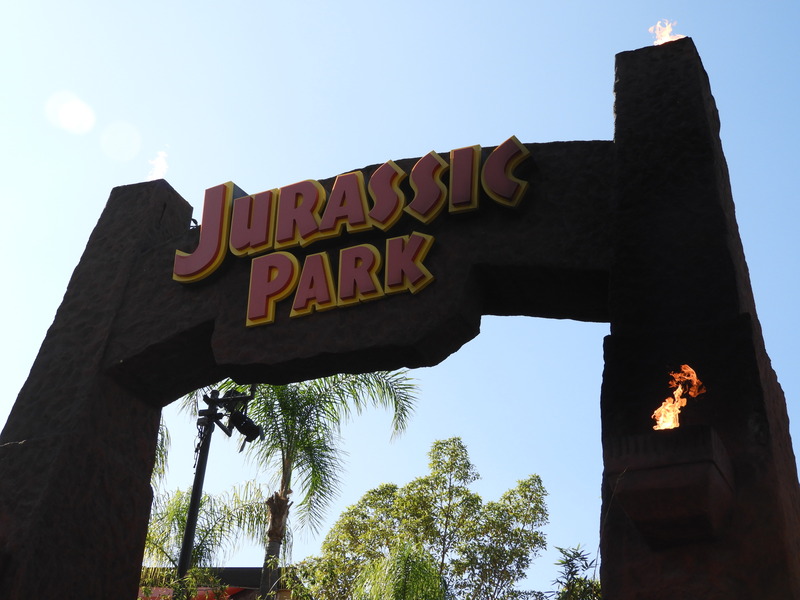 So I hope that they will continue to invest in real prop rides too like in Harry Potter and Jurassic Park. The park got a major plus for me by the way it’s build, with the different levels and stunning view. It was unlike any European park I had ever done and it’s a shame that we don’t have a Universal park close by (anymore). It makes me look forward to seeing its other counterparts around the world though! For the future, I hope they can add a major coaster to make the theme park experience more complete. If Phantasialand can do it (which also works in a lot of levels), so can this park! 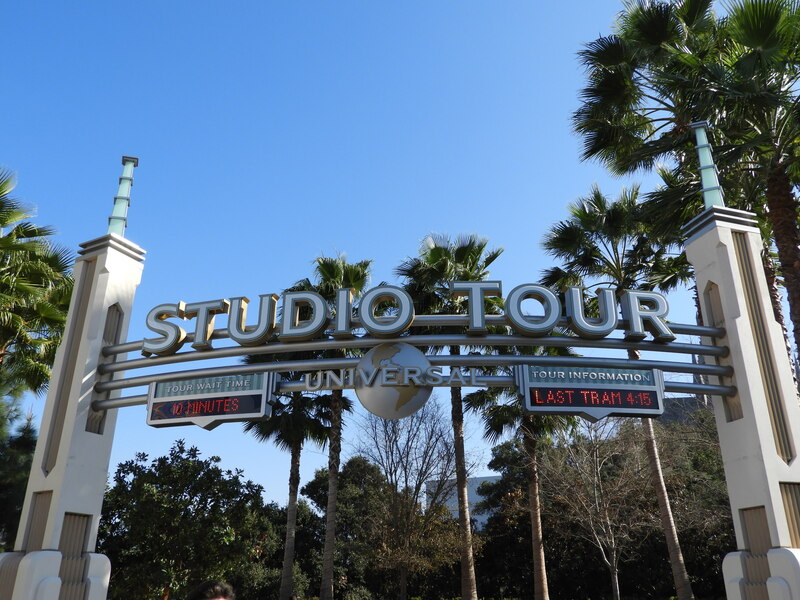 Thank you for checking out this first timer review of Universal Studios Hollywood! Sven is our European Coaster Kings manager, and we’ll soon share big news about the brand. For now enjoy some of our recent articles like Our Kings Island, Six Flags America, Holiday World, and Valleyfair! reports! Previous PostPrevious Vloggin’ thru Germany – ECK Vlog 1 and 2!